Autumn is a very special time for photographers. I found this photo somewhere on my wanderings a few years back and I saved it. An image search led me to the incredible photography of Robert Blair. His gallery contains dozens of beautiful photographs, most of them with nature themes, most of them very seasonal. But the glorious photo below is the first that drew me to Robert Blair; a photo he took in mid-November 2013 and called "Autumn Finale 2.0" Perfect for this time of the year: Snow on the ground, but still some leaves on the trees. Today in northeast Ohio, we had a rare, beautiful combination of autumn color with fresh fallen snow. 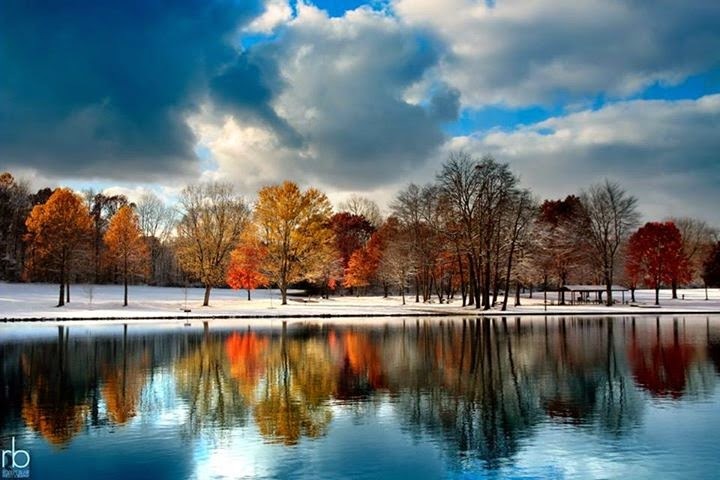 An amazing day where winter collided with autumn in Munroe Falls, Ohio on November 12, 2013. This is a special edit of the original version, a few man-made objects removed and some slight color and contrast adjustments for improved printing results. I'm mainly a video guy, but I have recently developed a passion for still photography. I have always enjoyed exploring the beauty of creation and finding ways to share the experiences I encounter.